Conveyors belts, inclined, declined, gravity and roller drive conveyors Yorkshire. Are you looking to improve production and dispatch times with conveyors belts, inclined, declined, gravity and roller driven conveyor systems? Here at 2h Storage we provide a wide range of conveyor systems each one to a bespoke design to fit your unique products and requirements. We offer a full design, supply and installation service for belt conveyors, inclined, declined, driven, non-driven and gravity conveyor systems. Do you need advice on the best type of conveyor systems or have an existing system that needs replacement or alterations. We provide multi-lane and multi-level conveyor systems and specialise in combining conveyors with semi automated picking and dispatch systems. Celebrating a large order but have concerns you can deliver the products to dispatch why not give us a call for a free consultation and site survey. We can look at your product and dispatch requirements and give you advice on all aspects of the storage and movements of goods and pallets throughout the warehouse or production facility. Our integrated picking and dispatch systems shown in the picture allow various products to be easily picked by hand and dispatched onto a conveyor system as individual products or in cardboard or plastic boxes. This can double the dispatch and pick rate and give a return on investment in less than two years. It also allows for products to be quickly and easily replenished and reduces pick inaccuracy dramatically. With the option to segregate particular orders or batches to a separate conveyor it stops any chance of cross contamination of different products, goods or geographic destinations. Our expertise allows us to manage your conveyor project from the initial design stage right through to installation and spares and maintenance back up. Are you looking at a new industrial unit and need a warehouse or pallet racking layout? Not sure on what the best design is? Well why not call in 2h Storage Solutions and benefit from our FREE of CHARGE site survey and design solutions. 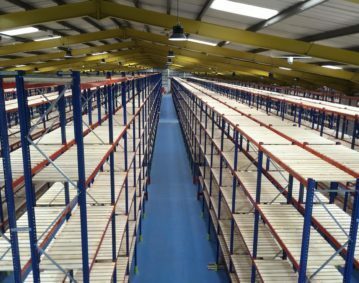 We will ensure you get the very best pallet racking and warehouse layouts in Yorkshire. We can take care of the layout and design of the pallet racking and warehouse advise on the best type of forklift trucks and storage equipment systems to help you store a wide range of pallets and goods. We look at pick rates pallet sizes and weights and the best options and design solutions to fit even the most challenging of warehouse and production situations. We specialise in dealing with more complex and challenging projects while we can add value and save costs on even simple and small warehouse and stores layouts. We also provide mezzanine floors, offices, barriers and everything you will need for your industrial facility from a simple plastic box to conveyors and gravity feed pallet and box storage equipment. With over ten years and four thousand successful projects we are perfectly placed to help you get your new project finished to the best standards and investment levels. We even provide rack leasing options and mezzanine leasing options allowing you to spread the costs and benefit cash flow. These options can even save you money with tax advantages. So call today and get your warehouse and raking project in Yorkshire and the North of England off to the best start. Are you looking for warehouse safety barriers and rack end safety barriers? Here at 2h Storage we design, supply and install a wide range of safety and rack barriers? We have a full range of simple tubular barriers, rack end arco, tube barriers and bollards through to mesh and solid partitions to separate fork lift truck and pedestrian areas. Do you need high grade high visibility fork lift barriers or barriers to protect pallet racking? We provide a full survey and design service for vehicle barriers, modular barriers, rack barriers and office protection barriers. Pedestrian barriers keep your site and team safe and help keep areas tidy and clearly defined. Vehicle barriers help keep staff, valuable stock, machinery and equipment safe from vehicle impact. Our modular barrier range can be made and designed to fit your site and work areas keeping your staff and site safe and providing a quality and professional appearance to you facility. Our pallet racking rack end and upright protectors can help you avoid thousands of pounds of damage to racking and avoid the disruption caused by pallet racking repairs. So whatever type of warehouse barrier, pedestrian barrier, modular or vehicle barriers you need call our team here in Yorkshire on 01765 640 160. Bob Blakeley warehouse pallet racking hero! Rarely do we see such raw talent in any area of life but coming from the warehousing and storage sector it’s fantastic! It’s not every Saturday night on live prime time TV that you get a glimpse inside a working warehouse seeing pallet racking at its finest. Here at 2h Storage the whole team were very impressed with Bobs excellent performance and excited to see his performance again on Youtube. We hope that Bob Blakeley will go from strength to strength and hopefully use his new born fame to highlight the hard work and importance of warehousing and stock distribution in modern Britain. It’s a big well done to Bob Blakeley warehouse pallet racking hero from all the team here at 2h Storage for your entire pallet racking requirements give us a call. 2h Storage was proud to attend the Warehouse Technologies Group event this week and a big thank you to all the team from Redirack and Troax for their invitations. At 2h Storage we understand the importance of keeping up to date with all the latest advances in warehouse technology and advances in warehouse pallet racking design. We know this is one way that allows us to help you get the best warehouse solutions. As one of the UK’s premier storage equipment suppliers it’s important that we listen to you and make sure we keep up to date with all the technical and regulative changes that affect the industrial sector. That’s why our team attend b building regulations seminars, technology and trade shows so we can offer you the best advice. Recent changes to the regulations for mezzanine floor building regulations will affect stair case design and new planned changes to part “L” of the UK building regulations will have further impact on warehouse designs. Why not check with your current supplier to check if they are up to speed with regulative changes before you find your important capital expenditure project has not been planned with these changes in mind. If you would like any advice on your warehouse pallet racking or mezzanine floor projects simply give our team here at 2h Storage a call 0n 01937 585 057. Timber and mesh decks for warehouse racking – 2h Storage Solutions. There are a number of options for decking warehouse or pallet racking, the four main materials used for pallet racking decks are metal in the form of galvanized sheet or mesh and timber and chipboard decks. Starting with the simplest chipboard decks come in different thickness to cope with different loading and can be used with stepped beams or with pallet support bars depending on the application and type of warehouse racking. With timber decks they tend to be quite standardised with the two main options being closed or open boards. This essentially means the deck panels are constructed with either the laths butted up together or left with gaps between again depending on loadings and application. With metal decks there are differing options you can chose between stepped beams for a flush finish of have the decks sit on top both options use pallet support bars. Or you can choose waterfall decks where the deck is folded so it flows over the beams hence the term waterfall. The most popular type of mesh decks are waterfall decks. If you have a requirement for these pallet racking decks give our team a call we would be happy to discuss the best options for you requirements.